To illustrate the problematic nature of adapting a Goodis novel to film, especially a black and white film, PFA curator Steve Seid read aloud a passage from Nightfall. To set the stage, he explained that the protagonist Jim Vanning is sitting in his apartment in Manhattan—a location not used in the film—and it's steamy and hot outside. Because he's in hiding, Vanning is too nervous to seek relief outdoors. He remains in his room and slips into a fragmented reverie: "It was a pale blue automobile, a convertible. That was a logical color that pale blue; logical for the start of it because it started out in a pale, quiet way, the pale blue convertible cruising along peacefully, the Colorado mountainside so calm and pretty, the sky so content; it all of it seemed pale blue in a nice, even sort of style. And then red came into it, glaring red, the hood and fenders of the smashed station wagon, the hard grey of the boulder against which the wrecked car was resting. Black remaining as more colors moved in. The green of the hotel room. The orange carpet. Or maybe it wasn't orange? It could have been purple. A lot of those colors could have been the color but the one color about which there was no mistake was black. Because black was the color of a gun. A dull black, a complete black, and—through a whirl of all the colors coming together in a pool gone wild—the black gun came into his hand and he held it there for a time impossible to measure and then he pointed the gun and he pulled the trigger and he killed a man." Seid then introduced Eddie Muller, familiar to Bay Area audiences as the Director of the Noir City Film Festival (backed by the Noir Foundation), but also a novelist, an essayist, a columnist and a filmmaker [whose recent short film The Grand Inquisitor has just become available online through Underground Film]. Seid qualified, however, that being the director of a festival isn't just an administrative task, or the vocation of someone with a love for film, Muller has over the years actively developed working relationships with the studios who have granted him access to their vaults where Eddie has spent enormous amounts of time—not just going through studio catalogues—but physically going into the vaults and actively hunting for and locating films, and convincing the studios to strike new prints. This enormous unseen and unknown effort precedes Noir City's programming and is—in a sense—a form of archaeology. Eddie Muller, ever clever with words, realized while listening to Seid's introduction that this made him—in effect—a "noirchaeologist." He's amazed he hadn't yet coined that term. He thanked his audience for coming out on such a lovely weeknight to be thoroughly depressed by a Goodis film. 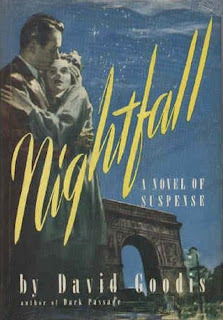 In 1947—the year that Dark Passage and The Unfaithful measured Goodis's brief Hollywood stint—Goodis wrote Nightfall. Why it took 10 years for Nightfall to be adapted to the screen is anyone's guess, though it is interesting to note that during the course of that decade the whole noir wave crested in Hollywood, subsiding by the late '50s. 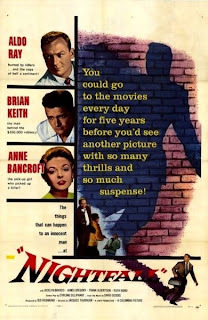 By the time Nightfall (1957) was filmed, Hollywood was at the tail end of the film noir era. The film itself has been neglected, though not necessarily maligned, and—truth be told—Nightfall reflects Goodis's writing at its most coherent. Goodis wore two different hats as a writer: he could write stream of consciousness on the page but also write coherent crime novels like Nightfall. As such, in Muller's estimation Nightfall is a much better book than Dark Passage, and possibly Goodis's best novel. At stream-of-consciousness Goodis was more a poet on the page, writing about personal demons, his alcoholism, full of strange peccadilloes. Barry Gifford already detailed how cheaply Goodis lived in Hollywood and how shabbily he dressed, but Muller added that—as a big jazz fan—Goodis would troll the jazz clubs and spend an inordinate amount of time in the blackest neighborhoods of Los Angeles looking for large women to verbally abuse him. Eventually, Goodis tired of Hollywood and Hollywood tired of him—it was not a match made in heaven—and he returned to Philadelphia where he moved back in with his family, cared for a handicapped brother, and paid the rent by churning out crime novels for Gold Medal Books. Some of these paperbacks are extraordinary for being professional, stream-of-consciousness, beat-style crime writing; the passage read by Seid being a good example of the pulse and rhythm of that period of writing. Generally what happens in a Goodis novel is that a man is torn between either a woman that he thinks he's supposed to love or a woman obsessed with him who tortures him and drives him to Hell. Basically, that's it. These stream-of-consciousness novels include Of Tender Sin, Cassidy's Girl and The Moon in the Gutter, whereas crime novels like Nightfall, The Burglar and Black Friday are more coherent and less about Goodis getting his personal demons down on the page. 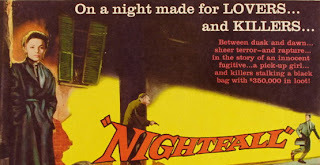 As mentioned, by the time Nightfall was produced in Hollywood the heyday of noir had peaked; but, unfortunately, because Nightfall was directed by Jacques Tourneur people want it to be another Out of the Past. Yet how could it be? 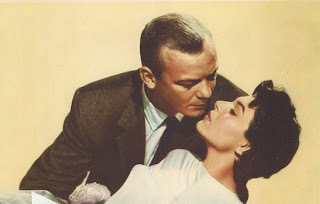 By the late '50s films weren't shot on a sound stage anymore, the extraordinary glamour was gone, and instead of Robert Mitchum the film starred Aldo Ray. 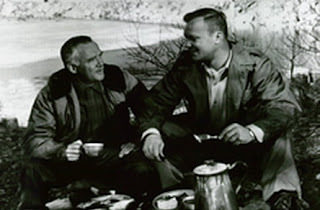 Though some people find Aldo Ray a problem in the film, Muller is not one of them. He feels Ray gives a terrific naturalistic performance in Nightfall. The naturalistic acting styles in the '50s had replaced the theatricality of the '40s. The end of Goodis's life is unusual in that he became involved in a complicated lawsuit and sued ABC for ripping off the idea for their hit series The Fugitive from the premise of Dark Passage. By the time he was in his late forties and early fifties Goodis's screws had started to become a bit loose and he became obsessed with pursuing this law suit, which he had little chance of winning. Nightfall is a terrific late-period noir film. Screenwriter Stirling Silliphant was quite young at the time, and though he'd written Five Against the House (1955) for Phil Karlson, he had yet to write The Line-up (1958) for Don Siegel and to become a hugely successful A-list screenwriter in the '70s writing The Poseidon Adventure (1972) and The Towering Inferno (1974). Like Raymond Chandler, Goodis is one of the more colorful noir writers and—though James Vanning in his novel is described as an artist with a vibrant palette—this is minimized in Burnett Guffey's black and white cinematography for Nightfall. 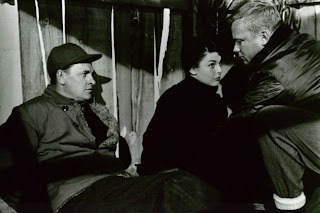 Concluding his introduction, Muller asked his audience not to compare Nightfall with Out of the Past and not to compare Aldo Ray with Robert Mitchum or Anne Bancroft with Jane Greer; to enjoy Nightfall on its own terms and for what it is: one of the best adaptations of a Goodis novel. Of course, comparing Nightfall to Out of the Past is precisely what Ryland Walker Knight set out to do at Vinyl is Heavy, measuring transitions of light and shadow with upstart enthusiasm. His approach is validated more fully in Chris Fujiwara's study Jacques Tourneur: The Cinema of Nightfall (John Hopkins University Press, 2001): "Before we know his name or his story," Fujiwara writes, "the film establishes Vanning as a stranger extremely sensitive to the transition between dark and light, no doubt because he himself is in some sort of transition…. Throughout the film, Vanning continues to serve as a kind of medium between dark and light (2001:236-237)." At Text of Light Max Goldberg comments: "Despite Tourneur's sensitive direction and editing, [Nightfall] flies its 'B' colors in its TV-like match cutting, limited coverage of certain dialogues and the outsized supporting players." Goldberg thereby traces structural and visual resemblances to the "on-the-run scenario … gripped by the same irrational logic" as in the Coen Brothers No Country for Old Men, where the chance encounter of a satchel filled with money likewise leads to dire consequences. "Tourneur," Fujiwara suggests, "makes no attempt to conceal the role played by coincidences and the arbitrary in the plot of Nightfall; he even highlights this role. …Throughout Nightfall, chance and unconscious processes determine key events. …In the world of the film, happenings are always accidents: the characters are under the spell of what André Breton called 'objective chance,' the congruence between fate and desire (2001:237)." As for comparing Anne Bancroft to Jane Greer, there's no purpose. Though it is interesting for me to compare Bancroft in the '50s with Bancroft in the '60s, when she came into her own. In Nightfall, as with many of her films in the '50s, she is a competent supporting actress, though her resourceful performance nowhere reaches the level of anguished disempowerment for which she was awarded a decade later. Continuing to ignore Muller's plea to resist comparisons, Chris Fujiwara comes up with some quite good ones. Nightfall, Fujiwara writes, "has striking similarities to Out of the Past: the mapping of the dualism of past and present onto that of country and city; the hero's flight from destiny by relocating and changing his name; his attempt to overcome his destiny by reentering an earlier situation (2001:235)." Vanning likewise shares Jeff's flaw of bad timing as Red (Rudy Bond) gleefully points out: "You're unlucky, fella. You're not lucky at all…. One more minute, two maybe at the most, we'd have been gone. Oh, yeah. You got a bad sense of timing." (Though unlike Jeff in Out of the Past, Vanning vindicates himself and survives his ordeal.) Fujiwara also notes: "Nightfall shares with Out of the Past a narrative structure in which the motives and circumstances of the protagonist are revealed in flashback. Whereas Out of the Past has a single flashback section, Nightfall distributes its flashbacks over the course of the film, so that the issues underlying Vanning's predicament are revealed progressively and become clear only fairly late in the film. This delay permits Tourneur to expand on the narrative ambiguity so crucial to his cinema (2001:239-240)." Thanks, Thom. I appreciate the feedback and am heartened to know the write-ups are of service. I've been having second doubts about all this film writing lately so your encouragement is especially timely. I know what you mean about feeling discouraged. Sometimes, when you write a post that you're convinced says something worthwhile and no one leaves a comment it feels like looking into a mirror that refuses to reflect anything back. Here's hoping that you're inspired to keep churning out the good stuff, pal.